The Empire State Building has cut its energy use by 20% as part of a $20 million retrofit that will ultimately save the owners over $4 million a year. 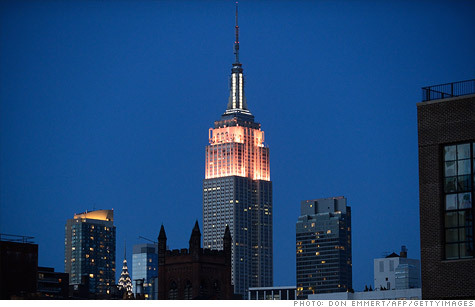 NEW YORK (CNNMoney) -- The Empire State Building is on an energy diet. The hulking building, a symbol of American power and, to some, excess, has cut its energy use by 20%. And that's just due to changes to the building's exterior. Once retrofits are made to tenant spaces on the inside, the second tallest building in Manhattan will be nearly 40% more efficient. The retrofits will cost $20 million once they're complete, and are expected to save the owners $4.4 million in annual energy costs. "After one year, we have proven that investing in energy efficiency gives building owners a dollars-and-cents advantage," said Dave Myers, a president at Johnson Controls, which conducted the retrofit. The renovations are part of a $500 million rehab plan for the building. The building's owners, Malkin Holdings LLC, filed for an initial public offering back in February which valued the building at $2.5 billion. --Filling the existing windows with an energy saving gas and adding an additional plastic pane. --Upgrading the building's cooling system. --Using computerized "smart" energy management technology that can adjust temperatures floor by floor. --Provide tenants with detailed energy use in their space. --Automatically shut off lights in unused areas. The move to make the Empire State Building more efficient was announced three years ago amid much fanfare -- Bill Clinton and New York Mayor Michael Bloomberg were in attendance at a press conference from the building's 80th floor. Energy efficiency often gets less attention than oil drilling, wind turbines or solar panels when it comes to tackling America's energy challenge. Yet efficiency often offers the biggest energy saving opportunity, and at a fraction of the cost of new sources. Buildings account for 40% of the country's energy use, and an average home emits twice as much carbon dioxide as the average car. But the country has made some impressive gains in the efficiency arena, both since the energy crisis of the 1970s and more recently amid high oil prices. The average refrigerator today uses a quarter of the energy it did in the 1970s, said Lowell Ungar, policy director at the Alliance to Save Energy. In the last couple of years the government has taken steps to make furnaces, air conditioners and refrigerators even more efficient, said Ungar. It has also begun the phase-out of the notoriously inefficient incandescent light bulb. On the building front, recommended building codes for both commercial and residential structures are 30% more efficient today than they were in 2006, said William Fay, executive director of the Energy Efficient Codes Coalition. By 2015, building codes are expected to be 50% more efficient. Not all the all states have adopted these stricter codes, said Fay, and that's one of the challenges in saving even more energy. Auto efficiency has made major strides in the last few years. George W. Bush famously raised fuel efficiency standards for the first time in decades during the last days of his administration, and Obama has accelerated the trend. Fuel efficiency standards have gone from 27 miles per gallon in 2006 to a target of 35.5 miles per gallon in 2016. By 2025 vehicles are supposed to average nearly 55 miles per gallon. That's a doubling of fuel efficiency. "We are twice as energy efficient as a county today as were were 20 or 30 years ago," Daniel Yergin, Chairman of the consultancy IHS CERA and one of the world's foremost energy analysts, said in recent Senate testimony. "And we ought to become twice as efficient again."